November 12, 2017: New York Times devotes its Sunday classical page to an upcoming album of pop songs sung by a former opera singer. November 12, 2017: Philadelphia Inquirer devotes its classical page to a preview of upcoming new music events in Philadelphia. November 16, 2017: David Patrick Stearns announced on his blog that he is accepting a buyout from the Philadelphia Inquirer. I’m not saying there is an causal relationship among these events. But the juxtaposition of the two Nov. 12 articles was striking – by wasting the limited space available for classical music that day, the Times seemed parochial compared with the Philadelphia paper. I am sad to see David Patrick Stearns go. His writing annoyed me, it pleased me, it offered me fresh insights – sometimes all in the same article. But it was always solid and thoughtful writing and never boring. He will be greatly missed. Philadelphia had its own unofficial biennial. In a town sometimes accused of championing composers from far away at the expense of locals, The Crossing choir’s June/July Month of Moderns Festival featured new works by both Robert Maggio (The Women Where We Are Living) and James Primosch (Mass for the Day of St. Thomas Didymus) at peak inspiration. In October, Kile Smith delivered The Consolation of Apollo, an ingenious melding of the writings of sixth-century Boethius and the musings of the Apollo 8 astronauts in 1968. Would these works have been written were there not a choir like this to sing them? To answer his rhetorical question – no, I think not, at least not in my own case. I wrote the piece knowing I could count on a superb performance, no matter what the challenges I set before the group. I’m happy to say The Crossing will reprise the piece next June 21. James Primosch’s terrific Chamber Concerto began dauntingly with musical ideas splintered over a large range of sounds, opening the door to an exquisite, mysterious garden of sound in the second movement, reminiscent of Olivier Messiaen, with a playfully intricate final movement. I quite agree with David’s comment about the performances being at a “remarkably high standard” – thank you, Network! 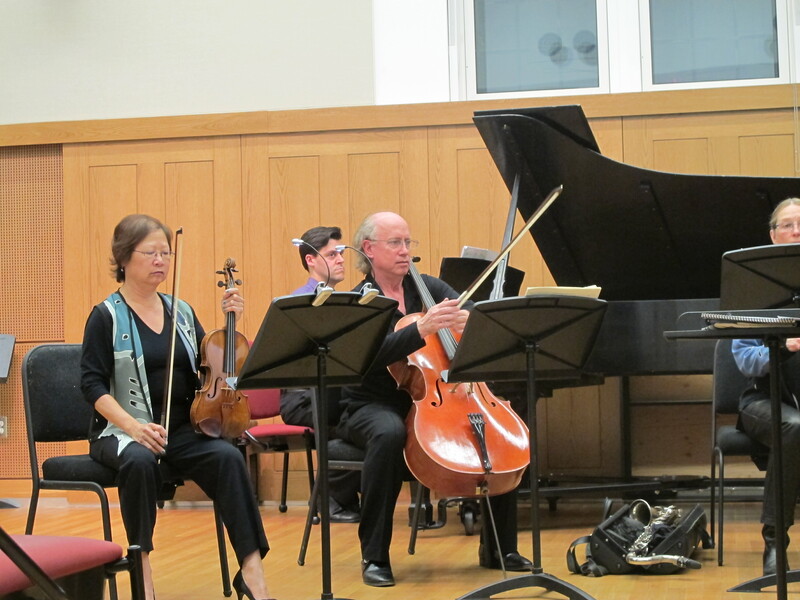 I was happy to see David Patrick Stearns’s positive comments on The Crossing‘s recent concert here in Philly, including some nice words about my piece, Spiralling Ecstatically. David remarks that he doesn’t usually associate me with choral music, which is pretty reasonable, given the fact that my choral music is not widely performed – I suffer, like so many composers, from second performance syndrome. But the fact is that I have written about a dozen choral pieces, five of them since the turn of the century. I am in the process of circulating a batch of scores among choral directors, and perhaps something will come of that; also, I hope the Mendelssohn Club’s CD on Innova of Fire-Memory/River-Memory will have an impact. For now, I’ll direct you to my website, where there is a listing of my choral works, plus some audio and score clips (note that the “chorus” webpage does not yet include the two most recent motets, Two Arms of the Harbor, and Gaudete in Domino). – Davd Patrick Stearns weighs in with a positive spin on the Allen Kozinn re-assignment story. 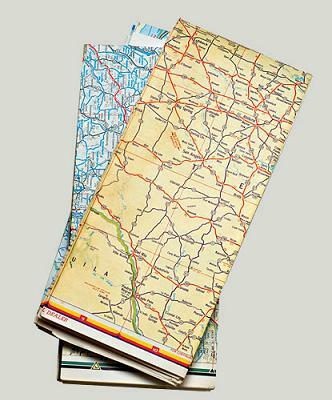 – season brochures are coming in over the transom thickly now. 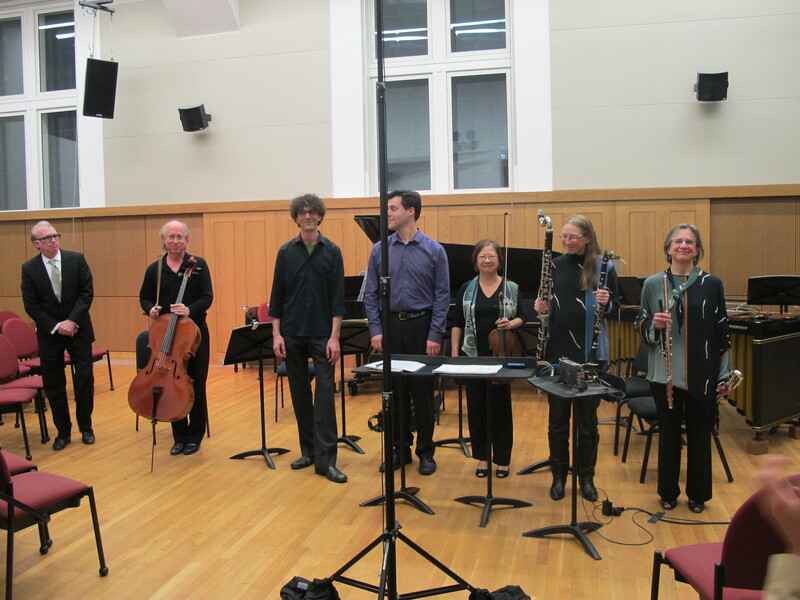 Boston’s Collage is offering Feldman, Saariaho, Corey Dargel, Yehudi Wyner, and the late George Edwards. They are also presenting Christopher Taylor doing the complete Vingt Regards of Messiaen. – go here for the sound of Wallace Stevens reading. – and go here for George Perle, Paul Lansky, and Virgil Moorefield on three generations of composition teachers. – fellow Columbia alum David Froom talks with New Music Box here. David quotes Roger Sessions as saying music should be “inevitable without being predictable” – that puts the task before us clearly and succinctly, doesn’t it? Thus, the quality of recent discs is consistently high. The Mendelssohn Club has never sounded better than on its new Metamorphosis disc with works by Philadelphia composers [Andrea] Clearfield, Jennifer Higdon, and James Primosch. More about the disc here. – SongFusion’s “States of Mind” concert is coming up next Tuesday, May 8, in NYC and will include my song “Every Day is a God” from the cycle Holy the Firm. It consisted of a peach-colored shirt, a green tie with white polka-dots, a knit belt of the most vivid purple with a large and ostentatious gold buckle, and an unbelievably loud gray suit with lots of black and brown stripes. A companion website for the book is here (you’ll need the password found in the book). – David Patrick Stearns offer a substantial interview with Esa-Pekka Salonen. – The inimitable Jeremy Denk writes about the Goldberg Variations on Deceptive Cadence. 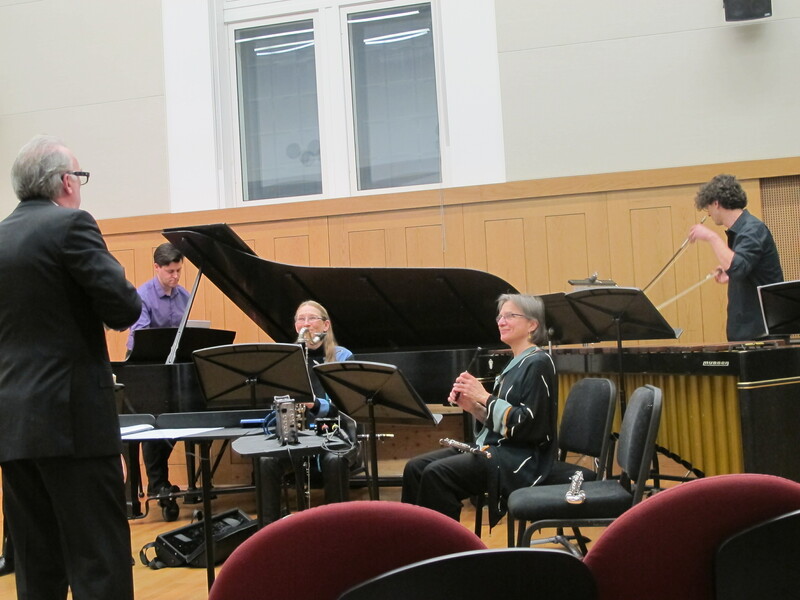 Here are some pictures from last week’s New York New Music Ensemble concert at Penn. The performance was superb, at times astounding. All the pieces had merit – I was especially struck by On That Swirl of Ending Dust by master of electronic media Eric Chasalow. The piece combined Eric’s exquisitely crafted electronic sounds with the live ensemble in tight synchrony. There were hints of jazz in the second movement, while the third movement was a quiet ritual, with bits of spoken text in the electronic component that made me think of a sober family gathering. Rand Steiger’s exuberant tribute to Elliott Carter, Elliott’s Instruments, enfolds fragments from an array of Carter’s own pieces. It was interesting how one could still recognize references to essentially athematic music. Yiorgos Vassilandonakis’s Quatuor pour la fin d’une ère evocatively explored liminal sounds, a dreamscape not quite in focus. Cloud Earth by Pulitzer Prize winner Zhou Long was less densely worked than some of the other music on the program. There were imaginative textures here, as well as a little too much wood block for me. – author Paul Griffiths has recent and older writings at his website.